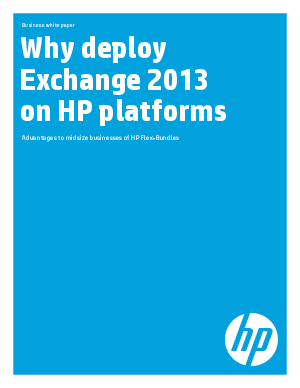 The HP Flex-Bundles for Exchange 2013 are right-sized solutions including servers, storage, networking and services that have been optimized for Microsoft Exchange. There are two HP Flex-Bundles for Exchange. One has been configured for customers who have 200–499 mailboxes and another one for customers with 500-1000 mailboxes. These solutions are low risk investments because HP understands how to build infrastructures for Microsoft environments and applications. HP and Microsoft have the longest standing relationship in the IT industry spanning 30 years. During this time, HP has gained a deep and comprehensive understanding of Microsoft products. HP has more than 34,000 trained Microsoft specialists, with over 13,000 of them attaining Microsoft-certification. HP has been named Microsoft Enterprise Partner of the Year five times and is Microsoft’s largest Gold Certified partner.